Alisa and I were walking through Staples this weekend when we naturally wondered into the mouse/keyboard section. Logitech had their own display at the end of the isle on the end-cap. Among the products displayed was the V500 Cordless Notebook Mouse. 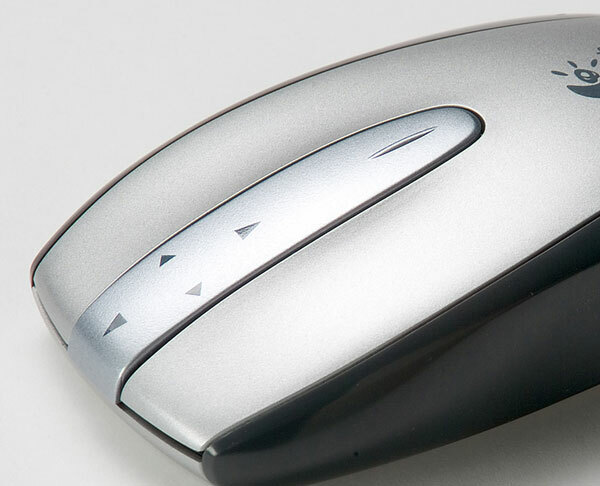 Marketed for use with a laptop, the V500 is a wireless optical mouse that comes with a compact dongle that stores in the body of the mouse itself. The mouse also has a tilting chassis design for comfort, and something they call an “All-Terrain Optical Engine”, which I supposed lets you use the mouse on a variety of surfaces.What stood out to me though, is the fact that the mouse only has two buttons. It has no scroll wheel. Instead, there is a hump in the plastic between the two buttons with arrows painted pointing forward and back as well as left and right. This mouse uses a solid-state scrolling mechanism. The surface responds to the touch of your finger, and follows it as you move it forward and back or left and right, simulating the action of a scroll wheel. I think this is PERFECT for a laptop mouse. This design eliminates moving parts and openings in the casing for dust and dirt to enter. I’m hoping Logitech will offer a Bluetooth version of the V500, as it would make an excellent mouse for my Powerbook. You can read more about it at Logitech’s V500 Product Page.